Musette. So you know it’s gonna be strange. Back when I lived in civili uh, Chicago I would walk the 3 blocks to the Francisco Ave Stop on the Brown Line. In the winter, that walk – just 3 blocks – could be brutal and I would comfort myself with thoughts of Spring. But in the strangest way. Without fail, I would imagine myself in a total Dior New Look outfit, wasp-waisted, full skirted, petticoated dress – but in a violet printed polished cotton that I’m sure M. Dior would’ve never considered in his lamest fantasies. I think the print came from a sheet set I had, which I adored, so it became representative of All Things Spring. But wait! It gets weirder. 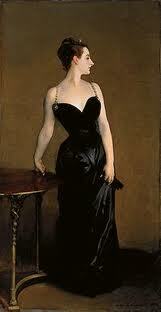 I would be in this dress, with black patent pumps and white gloves, hair coiffed in immaculate Dior style. And I would imagine myself plunging into a big pool of warm water! But not just any warm water. A giant warm tub of bubble bath! And the bubble bath would be Diorissimo. How weird is that? Who on earth plunges into a soapy pool of water in a violet-printed dress – where on earth would you find a soapy POOL? Why? Well, who knows – but warm Diorissimo-scented soapy water and that damn dress would sustain me, representing emerging spring, year after year, as I trudged through the ice and snow, on my way to the train. Things have changed since then – I no longer take the train, except to go back to civili, erm, Chicago and I haven’t given the soapy pool much thought in quite a few yonks – but Diorissimo still says Spring to me. As does that stupid dress. And I’m unapologetic about it. A lot of perfumistas are leery of proclaiming their love for this simple scent, perhaps because we might be inclined to equate simple with……uninteresting?. But like a vintage Dior gown or Madame X (who, I could swear, is wearing a vintage Dior gown), there is a stunning elegance to be had in simplicity. The notes yield an uncomplicated fragrance, as Edmond Roudnitska intended: greens, bergamot, lily of the valley (which yields little or no essential oil, so you have to get the accord elsewhere), ylang ylang, rosewood, amaryllis, boronia, jasmine, sandalwood, and civet. I am not going to embarrass myself or you guys trying to define the chemical composition therein – here’s the thing: Diorissimo smells like Spring, 1er Mai and is what every Catholic girl wanted woven into her circlet as she was chosen to crown the Virgin Mary, in Her own circlet of muguet. For me, it’s the embodiment of all the ‘pretty’ parts of Nature (with all the nasty bits left out) – and sometimes ‘pretty’ is exactly what’s needed. So if you love Diorissimo, don’t be ashamed to proclaim that love – love it HARD!!! And if you don’t love it, that’s okay – but recognize the genius it took to create something so stunningly, beautifully Simple. Simply Beautiful. What’s your Spring scent? Is it one you proclaim? Or is it one you sneak guilty little spritzes of – and hope nobody asks what you’re wearing? And what on earth is it about that violet print……..? I love spring and the duality of it. For beginnings I love Chamade, Gucci Envy ( green but not GREEN), Jo Malone Blubell (woods with a carpet of bluebells on a sunny spring day). Trying to love Diorssisimo as I adore lily of the valley but it’s slow going as no Diors, bar Dune, really agree with me. Currently looking for something with greens, non-indolic jasmine and ….a mystery smell that it is my brain but is frustratingly nameless! Oh, and I want sillage lately..I want to WAFT. At least my scent will waft as I am not waftsome, rather I am built for the fifties (though I would make an excellent life raft in case of emergencies). Suggestions welcome! 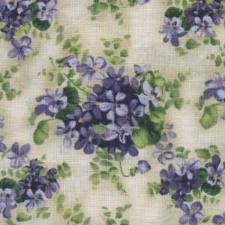 As for the violet print- its charming and light and needs a room with sheer white curtains billowing in a fresh spring breeze. Oh, and the bed needs a breakfast tray! And I need to be IN that bed!!! Have you tried Jacomo Silences? You might like that for a green – also, one of my favorites for Spring (but not today, as it’s 36F) TDC’s Charmes and Leaves. Sounds like Diptyque L’Ombre dans L’Eau, to me. Ugh. It’s 3:45 a.m. and I’m up with two little redheads with the stomach flu. Nobody around here is ever going to look at chocolate bunnies and jelly beans the same. But vtg Diorissimo is a welcome distraction and I would love to spritz some on right now if I didn’t fear it might trigger more yuck with the kids. I wore it for Easter. Often there’s that moment where I think I’m looking for something bigger or more complicated until my eyes sweep over one of several vtg bottles of Diorissimo I’ve collected. Perfection. Sitting in church Easter morning I was glad I went for simple elegance as there was a cloud of loud, cloying scents not mingling so well together. Aside from vtg Diorissimo I’ve been wearing M.Micallef’s Printemps. I’m not always a fruity-floral kind of girl but this one is really well blended and pretty. I’ve also been wearing Intelligent Nutrients Jasminas and Florascent’s Pipapo which I really adore. So sorry about the stomach flu! Yep, barfing up the Easter Bunny’s goodness is not a pretty sight. Diorissimo seems perfect for Easter. I went to a little country church. All they decorate with is tons of Easter lilies (a smell I love, by the way) and there was incense. So that’s the smell of Easter to me, lilies and incense. Hmmm …. you know what, I’d go with the Van Cleef Lys Carmine or their fabulous Muguet, and I don’t even like LOTV. Anita, did you ever try their muguet? Joanna, hope the little ones are better now. Bless your heart! Thanks everyone. I was beginning to think I was Super Immuno Mom as they haven’t even had a cold since last fall. I have a realitive you shows up for family functions despite their kids having lice or the flu or you know…Ebola. As I was trying to feed their kid lunch and she said, “My tummy still doesn’t feel too good…” I knew my kids would come home with Easter eggs and the flu. Back to Diorissimo, there are very few lily scents that work for me.I wouldn’t have ever tried vtg Diorissimo if I hadn’t read A Discovery of Witches…glad I did both. Also, if anyone has info on where I can still get my hands on Florascent fragrances, (I know SaffronRouge has a few left but I’m looking for more Pipapo and Umami.) please let me know. Apparently they stopped exporting to the US. I have both a long, full cotton skirt and a pair of really nice pajamas in almost that exact fabric, so laugh away. I think your vision sounds lovely. Except if I fell in a vat of Diorissimo I’d probably curl up and die. But I appreciate the concept! I remember the first time I ever visited Chicago with Kerry, at Thanksgiving. We were going shopping at Marshall Fields (! when I discovered Frangos!!) but in the meantime we were outside walking and I of course didn’t own a real coat, and I thought, how do people live here? This is like the f’ing South Pole. I was waiting for a penguin to skitter across the street… now, I love me some Chicago, but I try to stick to April-September. Hey, you remember when we came for the sniffa in the middle of a hurricane? Heh. I’m nodding my head like crazy to your post, March. I used to have a lovely cotton batiste nightgown in a similar print and I almost went into mourning when it wore out and became too holey to wear. And I loved Marshall Field’s and Frangos as well; in fact, the last November before they became Macy’s, I made a memorial field trip to shop there one more time, see their beautiful Christmas tree, and eat in their restaurant (can’t remember the name of it). That was the weirdest, most wonderful day! Soaked to the bone, laughing like hyenas! We’re having Typical Chicago Weather down here in Cowtown. 30degree drop from yesterday. 35F with a galeforce wind. Folks back in winter wear. Love this post, Musette! I’ve always thought Diorissimo rocks, although I haven’t worn it in ages. I do like VCA’s Muguet, as March mentioned above, and since vintage D is kinda hard to come by, the VCA has been giving me my LOV fix when I need it. Fleur de Narcisse – although I am starting to hoard it since my bottle is half empty. And if you stood on the platform of the Francisco el stop right now, you would be able to peek into my little Chicago garden full of real narcissus and hyacinth. Merle’s closed along with the martial arts school on Francisco where I used to go to 5AM boot camp but we now have a wonderful cafe just on the other side of the tracks called First Slice with amazing pie! And things have quieted down quite a bit now that Blago has gone off to the land where they won’t let him color his hair…. Odalisque (PdN) which, since the reformulations, has become a lilly of the valley fragrance. And I have a tiny bit of Diormissio, which I’m hoarding because no occasion seems special enough to use it up. And EL Tuberose Gardenia. Really, any florals mean “spring” to me, unless they’re loaded with spices or oud. Odalisque is one of the few PdNs I can wear. It’s lovely! Though I have the original, so can’t really imagine it becoming a LOtV – must investigate!!! our Spring sprang – we’re now back to winter, minus the snow. I wrote this last night, when it was 30degrees warmer. Diorissimo would get its head bitten clean off today! Everything is blooming right now, everything. It is gorgeous. I have my little bit of Diorissimo, my Violetta, my Crown Bouquet, my DSH White Lilac… I’m good. You can have the dress!!! I would have to wear 3 girdles to make it look right! I’ll keep the warm, soapy pool – you’re right, though. It is weird. But today, with near-freezing temps and the wind gusts at hurricane levels, I’d love to be in a hot tub of soapy water. Well it’s me, rosarita. Just sayin’, in case my comment identifier is my FB account, which is under an alias, because I’m only on FB to follow blogs & businesses and I’m hiding from certain people (nothing sinister.) Ok, on to today’s very interesting post! My darling Ms A, I have no idea why anyone would need to hide a love for either Diorissimo or a lovely violet print! I only have a sample of the former and a scarf like the latter, and I’m quite fond of both although I admit neither one really feels like *me*. My favorite scent for spring is Chanel Eau Premiere. I also have a decant of L’Artisan La Haie Fleurie; I think it’s the prettiest jasmine I’ve ever smelled. And a mini of Guy LaRoche Fidji for the hyacinth. Now, as for the spring fantasy whilst battling Chicago sidewalks in midwinter…..well, whatever it takes, right? That’s a circumstance that requires some determined imagery! Today’s POST is interesting? Ya gotta be kidding me! You throw down a ‘hiding’ story like that…and you call my POST interesting? :Ssshh: but I won’t pry…. I remember that hyacinth in Fidji. That is so pretty!! Gee, I love Fidji and have a good backstock of it (edt, parfum, bath stuff) – but I’ve never noticed a hyacinth note to it. How odd! Anyway, Fidji is a summer scent for me, though for pleasant summer weather rather than blazing desert heat. Musette, that is a wonderful fantasy, right down to the violet print. Diorissimo is the very first sample I ever owned. It had just been released (yeah, I really am that old) and my mother had been shopping in Charlotte and gave me the tiny bottle. I still have it. So it is indeed a very fond fragrance for me. And it always makes me think of tulips, probably because the next time Mother took me shopping, Ivey’s dept store was decorated with tulips of all colors. But Diorissimo is not only a springtime scent for me. I use it when I NEED some Springtime. WOW! How great that you still have that bottle! What memories. Nothing says Spring quite like Diorissimo!!! Did your mom make you wear little white gloves? Mine always did. Nailed it in one! I never got to be May Queen, alas – but I always had my own May Queen shrine in my room (as did a lot of us convent-bred freaks) – that way you could have your May processional Any Time You Wanted. My Barbies were the attendants. That Blessed Virgin statue got quite a workout! I’d love to see video of that Barbie-filled procession! The day before Easter, I was wearing MDCI Un Coeur en Mai. It probably has the truest hyacinth bloom that I have ever smelled. It has just enough green not to make me run to the hills. I don’t know what posessed me to wear Amouage Memior for women on Easter. Yesterday was Worth Courtesan. Courtesan has snuck up on me and now I adore it. March would be SO proud. She’s been flying the Courtesan Freak Flag for years!!! Those violets remind me of my mom’s teacup collection, which includes several violet cups. The church ladies would come over Wednesday evenings and drink their teacoffee out of them, so to my little 6-year old brain, that spelled elegance. It hasn’t changed with the passing of 30 years, either. LOVE the Diorissimo. And what violet-inclusive scent is the best for Spring? (Prepare to roll eyes, Auntie A!) Apres’ L’Ondee… the good vintage stuff. Which I have a miniscule amount of and use sparingly. But I’m of the opinion that good perfume, like good china, should be used and not just seen, so there you have it! Wear it, sweetie! It’s meant to be enjoyed! I got over my hoarding the day I nearly died in a motorcycle crash – seriously. I force myself to use EVERYTHING now – especially the good china!!! Since I live in a mild-winter climate, spring is lovely but not so desperately awaited, nor so great a change when it arrives, as it is in the Frozen North. But I still have a couple of spring favorites that don’t seem quite right in winter or fall: Chanel no 19 and SL Bas de Soie. They seem to amplify the fresh color of young leaves and blossoming orchards. I love Bas de Soie. But I love it in the dead of winter. Weird, huh? Nobody here has mentioned Debut (from Parfums Delrae)? That’s a lovely scent for 1er Mai. I’m not as fond of muguet as many people are, but I’d still like to give Debut more time on my skin – unfortunately, my dog ate my sample. No, he didn’t actually eat it glass and all, but he crunched up the little envelope it came in and broke the vial. He is oddly obsessed with my perfume samples, and I can’t figure out why. I don’t like any detectable skanky note to my scents – but there must be something a dog would love about them! Glad he’s okay!!! My dogs couldn’t care less about perfume, excepting the occasional sneeze. If it doesn’t smell like food (or prey) they are oblivious. I love the vintage Diorissimo, and I’ll put some on when I get home from work. It is cold-ish here, so I am clinging to some of my winter frags for a little bit longer (wearing Montale Aoud Rose something today). Musette, the violet print is lovely! Mind if I borrow that fantasy? I just got back from visiting friends in Chicago who just happen to live 2 stops from Francisco. I even made specific note of it as it’s the stop near where the River (North branch?) goes through people’s backyards and there were a few docks and boats and such. It seemed so crazy to me – I declared that I wanted to live in that very neighborhood, but no one was fooled as I’ve lived in San Diego for 11 years, so that kind of weather just doesn’t agree with me. It was great for a change of pace and the weather wasn’t too bad for 6 days, plus I got to go to a Barney’s for the first time and try a bajillion things! Spring scents, to get back on topic – Atelier Trefle Pur, Osmanthe Yunnan, Rose Ikebana, Kelly Caleche, and the Byredo La Tulipe sample I got at Barney’s! Small world! And yes, it’s a weird little enclave – like Brigadoon! There are a couple of those in Chicago – these bizarre little enclaves that seem to be lifted out of another world, usually surrounded by heavy urban life! Glad you enjoyed Barneys! And I love your spring list – am intrigued enough to want to revisit OYunnan! I love Diorissimo, and I’ve only smelled the modern version, not the vintage! And your fantasy doesn’t sound weird; I love everything about violets. That outfit is just to my taste, only I’d choose to fall into the Diorissimo bath BEFORE putting the dress on. I wonder if they made it in bubbles? I have some vintage body lotion (gift from a VERY wonderful friend. VERY! )…I was tempted to hoard that, then I remembered my rule about Not Hoarding. So now I use it, along with the vintage EdP and edt I have. LUSH! and what a perfect bridal scent! You know what I love best about this post? It’s not the harkening to a harbinger of spring, though that’s welcome. It’s not the lovely discussion of a scent, enjoyable as that might be. It’s the description of your daydream, and the sense of recognition it provides. That “Ah, what a relief, I am definitely NOT the only weirdo in the world, since Musette is clearly stranger than I” moment, that gives me some solid reassurance. Thanks for that! We aim to please, darlin’!!! I like LOTV, but it’s my mama’s scent, so I have never really worn any. I have never smelled Diorissimo, but from the raves, I’m sure it must be lovely! I’m a hyacinth girl for Spring, Penhaligon’s Bluebell in particular. I’m a violet girl all year long…love, love love. L’A Verte Violet is my HG, but I love ’em all. I think I will try and hunt down some Balmain Val Verte, as well….feeling very green this Spring, and I have never tried this one, either! I adore that print, and would gleefully take a 50s style wasp-waisted, full-skirted gown made from it. Vent vert, not val…. good grief! Vacances…green hyacinth and lilac…my ultimate Spring fragrance. But close behind is Gobin Daude Sous le Buis. Sigh. Why are all my favourites discontinued? Why?? Musette, you really are crazy in such a great way! In spring, my nose is as fickle as the weather. Yesterday and today were windy, and beautiful, but a bit cooler, and I needed Jil Sander Woman III, which is warm and almost masculine, and then I needed to sleep in J’Adore. One week it was Nuit de Tubereuse, though. And I guess a recurring spring favorite is aldehydes, which are fresh in a spring-like way and have enough spine for the still cool temps. Florals are good for spring but they can’t be too wimpy or too sultry, can they? My spring scents have been Week-end a Deauville, Un Coeur en Mai, Jardin sur le Nil and (to a lesser extent) Ormonde Jayne Tiare. In particular, the original Week-end a Deauville smells like spring to me. I currently live in Florida where spring lasts a very long time, and I think that if I had an unending vat, I’d wear Week-end a Deauville every day.